This is my snapshot of a gray Mark Rothko on a gray museum wall. * The photo doesn’t flatter it, though it’s a little hard to make out, even in the flesh. It’s pretty spare for a Rothko. 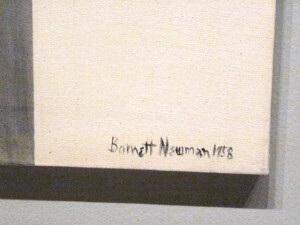 The white margin looks like a frame, but isn’t; it’s just an uncharacteristically messy and unresolved edge of white canvas. The intriguing thing here is the pattern of shadows on the wall below the canvas. On most paintings those would just be shadows, but here they add three new shapes to the painting: the darker and lighter shadows, and the white margin at the bottom that gets folded in by them. It’s as if Rothko had simply been quoting from life, and here is a bit of the life he was thinking of. 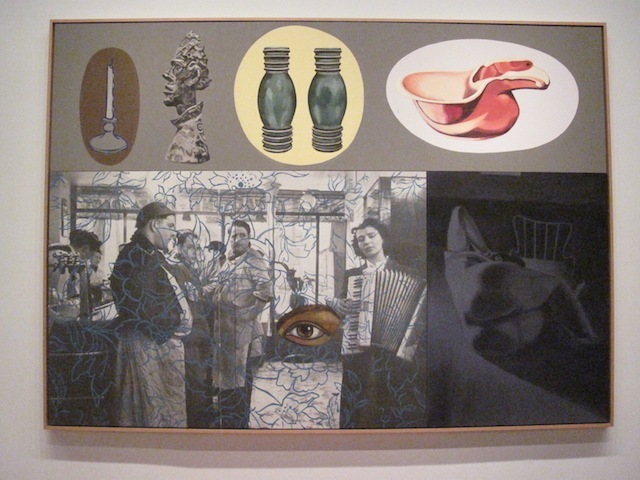 *Still working on the Robert and Jane Meyerhoff collection at the deYoung Museum in San Francisco until October 12. Old-fashioned (call it “pre-war”) art was often inventive and visually complex. 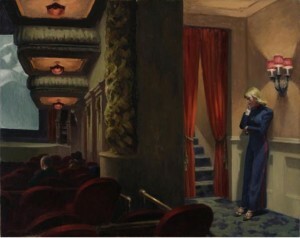 The Edward Hopper piece here is full of odd colors and shapes. Its rhymes and repetitions–the bread and butter of composition–are subtle. But it works, it holds together, and the only real diss that a committed modernist could lay on it is that it’s a “picture:” a representation of a real space. Worse, as “pictures” often do, it tells a story: cute, bored usher lost in her own thoughts. A great deal of post-war modernism has devoted itself to escaping the story-telling conventions of pictorial representation. Flatly abstract art often succeeds, although it’s hard to find abstract work that’s actually more robustly abstract than this Hopper–and so far as that goes, much abstract art projects such a strong emotional charge that we respond to it in almost a narrative way. 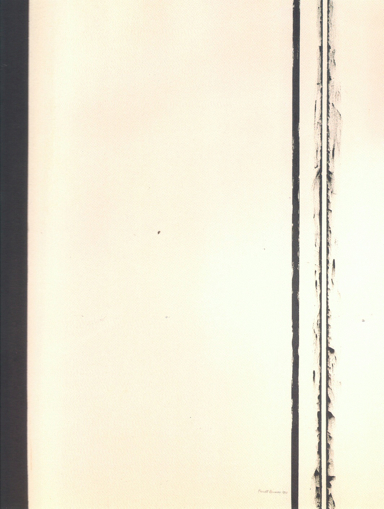 Check out Barnett Newman’s “Stations of the Cross” in last week’s post. Newman doesn’t use a cute gal, but he still employs a story to grab his viewers and coax them into reinforcing his devices with a web of their own associations. Then there are intermediate examples. 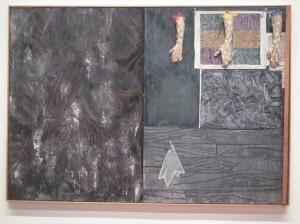 The Meyerhoff collection now showing at the deYoung Museum in San Francisco includes several interesting examples, such as the Jasper Johns below. In effect, the Johns is quite like the Hopper. The abstract shapes and areas combined with stuck-on arms create a similar sort of visual disjunction. But the title is evasive where Hopper is frontal. “New York Movie” doesn’t waste your time: you’re looking at what you think you’re looking at. “Perilous Night,” on the other hand, fends off the idea of the narrative image by implying a maelstrom of some sort without tying the viewer down to any particular story. You’re intrigued? Interpret the pieces as you like. Let your imagination rip. The Hopper is rich and complex but there’s only one way to read it. Johns requires you to be a co-participant if you find his elements interesting enough to make the effort. rather than any expressive purpose. Surely, the viewer is invited to think–surely with all this–well, whatever–there must be some meta-narrative. Not a “picture”–something grander. David Salle pushes the same approach another step along. This piece throws in several perfunctorily unrelated images including his trademark naughty bit to make it clear that he’s going for something serious and sophisticated. Paradoxically, the result for both Fischl and Salle are “pictures” in the most literal sense: pictures of fashion art. Hopper and Johns look better and better. 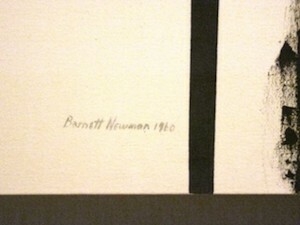 The show includes all fourteen of Barnett Newman’s “Stations of the Cross,” painted between 1958 and 1966. Now I have to admit that the title of the series pulls my chain. Talk isn’t what makes a work of art important. 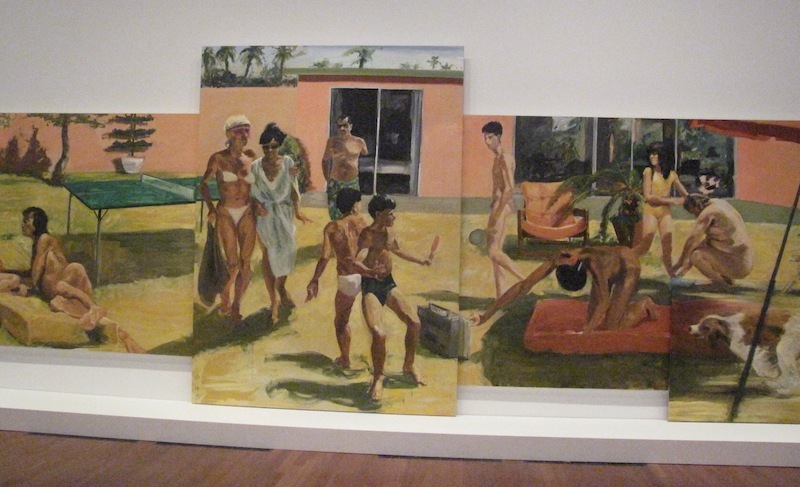 But just looking at the paintings, these are large, serious pieces. Some are more compelling than others, but nearly all are substantial. 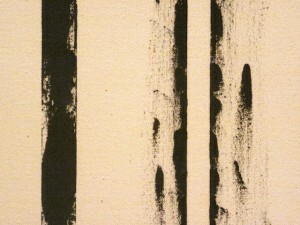 Each is focused on some subtlety or other–in “Third Station” (right), it’s the texture of the two stripes along the right-hand side (see the detail below). The power of the thing is in the minutia: they’re stripes, but no inch is quite like the next inch. ** The broad, open spaces of the canvas give the little things a great sense of scope and intensity: the world is huge, and then there are all these intricate, intimate things happening. You follow a stripe or an edge along, and it gets very involving. Okay, that’s interesting as a beginning point for him, as a part of his train of thought. Artists have these internal monologues. And yet I doubt that many viewers, contemplating this series, would be put in mind of Biblical themes if they weren’t prompted. I have to think that this is simply Newman’s ploy to impart spiritual grandeur to an abstract formal exercise. It projects insecurity. It’s as if he were standing behind me in the room, tapping me on the shoulder to inform me, in case I’m not sensitive enough to figure it out on my own, that this is Big Stuff. And then there is his signature. You’d think that on canvasses so grandly conceptual, so provocatively minimal, so baldly calculated in their nuances and lacunae, that a name, a bit of cursive, would be an intrusion, an alien presence. Nevertheless, there is a personal, squggly signature written small but earnestly somewhere along the bottom edge of each canvas. In the context they seem oddly cuddly and domestic. Possessive and insecure. Go figure. *Well, mostly well advised–any collection that includes David Salle or Eric Fischl has clearly gone off the tracks at least temporarily. We’ll come back to that next week, along with other, serious delights. 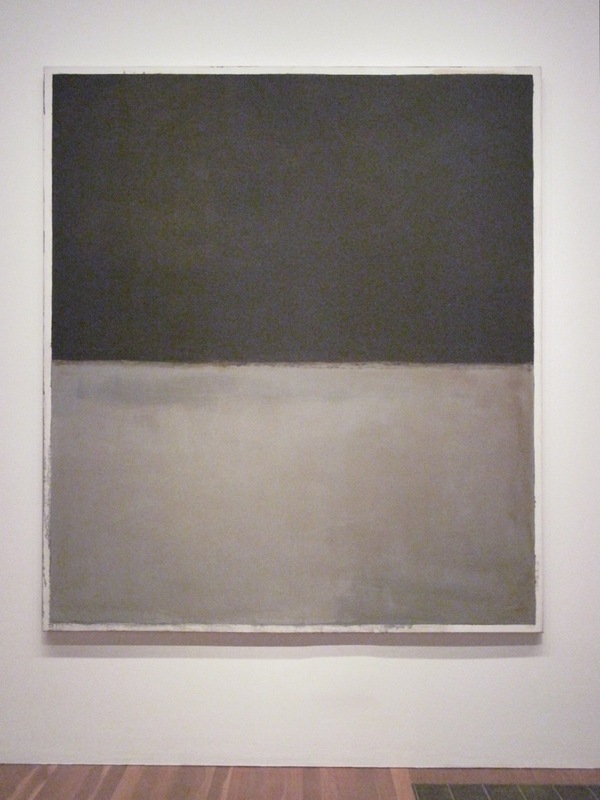 ** See similar devices in Rothko: archive, 11/30/12.